Garmin GPSMAP 76CSx adds a whole new dimension to the mariner-friendly 76-series navigators: a high-sensitivity GPS receiver, barometric altimeter and electronic compass, microSD card slot, colour TFT screen and turn-by-turn routing. Garmin GPSMAP 76CSx - colour navigation and direction for your land and sea adventures. Garmin GPSMAP 76CSx has been discontinued. Garmin GPSMAP 76CSx adds a whole new dimension to the mariner-friendly 76-series navigators: a high-sensitivity GPS receiver, barometric altimeter and electronic compass, microSD card slot, colour TFT screen and turn-by-turn routing - features that have made the Garmin GPSMAP 76CSx and its counterpart, the Garmin GPSMAP 76Cx, a mainstay among serious outdoor enthusiasts. Find your way through the wilderness with the Garmin GPSMAP 76CSx's high-sensitivity GPS receiver, which acquires satellite signals quickly and tracks your location in challenging conditions, such as heavy tree cover or deep valleys. You can use the built-in electronic compass to view bearing information even while you're standing still, and the barometric altimeter tracks changes in pressure to pinpoint your precise altitude. You can even use the altimeter to plot barometric or ambient pressure over time, which can help you keep an eye on changing weather conditions. The Garmin GPSMAP 76CSx's bright, colour TFT display makes it easy to distinguish details on the screen in any kind of lighting. 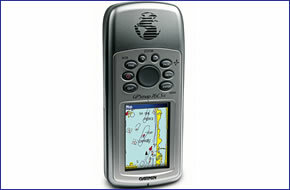 And, like the rest of the 76-series, Garmin GPSMAP 76CSx is IPX7 waterproof and even floats in water. Storing data is easier than ever with the Garmin GPSMAP 76CSx's removable microSD card. This included blank card stores up to 128 megabytes (MB) of optional maps or other data. The card slot is located inside the waterproof battery compartment, so you don't have to worry about getting it wet. When navigating on the road, the Garmin GPSMAP 76CSx provides turn-by-turn directions to your destination. It also accepts optional preloaded microSD cards with MapSource data for your off-road or marine excursions. The Garmin GPSMAP 76CSx is preloaded with a worldwide basemap. Question: Web updater is not compatible with the my Garmin 76csx so I'm needing an micro SD card of the Republic of Ireland for the unit. Do you have any? Answer: You will need to ensure you are running the latest software/firmware version on your Garmin GPSMAP 76CSx to ensure 100% that the latest map we sell will work with your Garmin GPSMAP 76CSx. I would recommend that you speak directly with Garmin about the ' Web updater' and installing the latest software version via Garmin Express. Once you have updated your Garmin GPSMAP 76CSx with the latest software, you can then purchase the UK and Ireland street-level road maps, knowing it will successful work with your Garmin GPSMAP 76CSx. Do you have a question about the Garmin GPSMAP 76CSx Maps? Submit your question via our contact page.